L.A. to Offer Housing to 50 'Most Vulnerable' People The county has hired a group called Common Ground to determine which homeless people are the worst off. Those people will be offered a free place to live. A similar strategy helped decrease homelessness by 87 percent in New York's Times Square, according to the nonprofit. 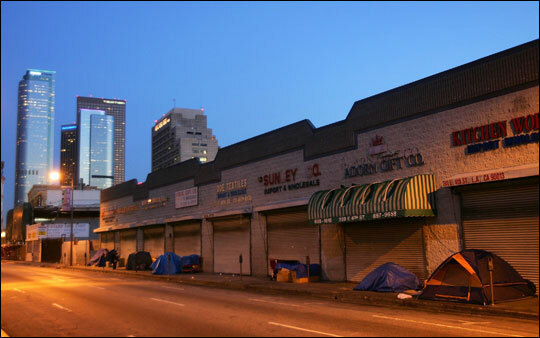 Tents are a common sight in the early morning landscape of downtown Los Angeles. In a project similar to the one planned for Los Angeles, the nonprofit organization Common Ground says it was able to remove 87 percent of homeless people from Times Square between 2005 and 2007 through targeted efforts. Could it be true? Read about what exactly this astounding figure signifies. 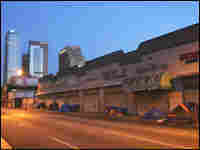 By about 5 a.m., Skid Row dwellers usually rise and move to avoid getting into trouble with the police. Every morning this week, before the sun comes up, a group of 25 or so people has been conducting a survey on Skid Row in downtown Los Angeles. It's not your typical questionnaire –- ultimately it aims to determine which of the people sleeping on the streets are the worst off. Hidden behind L.A.'s facade of glitz and glamour is one of the worst homeless problems in the country. The surveys are part of the county's most recent attempt to address the issue. "Project 50" is oriented around combating chronic homelessness by identifying the 50 people on the streets who are the most vulnerable and then moving them into apartments. "You can't really solve a problem before you know what it is," says Becky Kanis of the nonprofit group Common Ground, which developed the concept and is now spearheading efforts in southern California. Kanis, who is director of innovation for the New York-based organization, spends her days trying to change the way people think about homelessness. "The old approach is really a first come, first serve thing," she says, adding that the problem with that approach is that the people who get the available services usually aren't the ones who need them most. L.A. County brought Kanis and her team to Skid Row to find the people that would never find them and their services. When Common Ground applied the same technique to New York's Times Square, they found that the number of street homelessness plummeted by 87 percent in two years. "It surprised us some, too," she says. "We were only shooting for a two-thirds reduction." The overwhelming majority of homeless people not only want to be in permanent housing, Kanis says, but when they get there, they stick around. Early in the morning, however, half-asleep amid scurrying rats, piles of human waste and trash, not everyone is eager to be questioned by strangers claiming humanitarian intentions. It's difficult to see, as many of the street lights have been intentionally broken to make drug transactions easier. Some inhabitants are just coming down from crack highs. Others are resistant to talk because they've chosen Skid Row as home in order to disappear — not be included in some public list. Surveyor Mack Garland pushes on, asking probing questions about health problems and drug use. The answers will be used to create a "vulnerability index," determining who gets housing and who doesn't. To put it bluntly, these questions are meant to identify those most likely to die on these streets in the next year. Garland also snaps a picture so his group can later locate the 50 fortunate enough to have been determined the most unfortunate and get an apartment. "You get stuck down here. We're here because we don't accept love and we don't give it," says a man who calls himself "Artist Woods." He's been on the streets for 28 years, he says, ever since he was honorably discharged from the Marines. It's 5 a.m. If "Artist Woods" and the others sleeping here don't leave in the next hour, the police will remove them before the streets are bustling with holiday shoppers. Skid Row, after all, is only a few blocks away from L.A.'s downtown core, which is seeing a wave of gentrification. As much as there are humanitarian incentives to clean up the area, there are also economic ones; elegant lofts sell much more quickly, and chic new bars are more inviting without homeless people lingering at their entrances. Not to mention the price of the alternative "cleanup" method. "To house someone in jail is more expensive than the Four Seasons hotel," says Zev Yaroslavsky, chairman of the L.A. Board of Supervisors. He says this project could end up saving taxpayers millions. Although 50 is a relatively small number, he says that if this program succeeds, it will be expanded to help hundreds left on Skid Row. "We've been intimidated by the sheer scale of the problem into doing very little," he says, adding that he hopes those days are over starting tomorrow, when the county will release the list of the 50 most vulnerable. 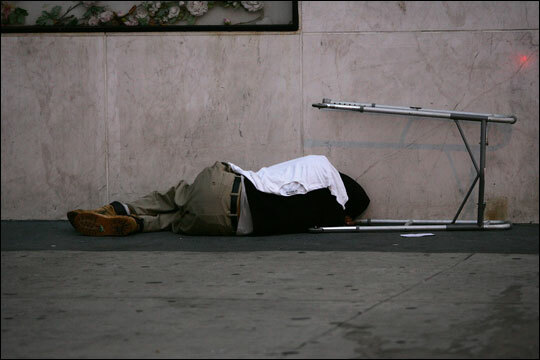 In an effort similar to the one planned for Los Angeles, the nonprofit organization Common Ground claims that, through targeted efforts, it was able to remove 87 percent of homeless people from Times Square between 2005 and 2007. What exactly does such an astounding figure signify? Could it be true? Like many who hear the figure now, the organization's leaders were skeptical when they began. "We thought Times Square was this huge, intractable problem with tons and tons of homeless people," says Becky Kanis, director of innovation for Common Ground. Initial efforts to decrease the number of homeless accomplished little; they moved about 40 people into housing, but the number of homeless in Times Square remained high. At that point, the organization decided to take a new approach. They surveyed people who slept in the 20 blocks around the Square, identifying the "most vulnerable," and moving members of that group into housing. "It was when we started housing those people that we started seeing the changes in our census count," Kanis says. According to Common Ground's statistics, the number of people sleeping in the Times Square vicinity went from an average of 48 people in 2005 down to 7 in 2007. The number of single homeless adults in the city overall decreased by 15 percent over these same two years, according to a Sept. 1 article in the New York Times, but nonetheless, this is a major shift in figures. The key, the organization's leaders say, lies in understanding the dynamics of a particular homeless population. "We went out early in the morning so that we could tell who was sleeping there as opposed to commuting into the area, and really focused on building a relationship and figuring out what needs and wants they had," says Kristin Barlup, director of Common Ground's Street to Home Manhattan project. "...Some people take a while to trust you. You keep at it and work with them." Some people take issue with the Common Ground concept. L.A. City Councilwoman Jan Perry, whose district includes parts of Skid Row, told the L.A. Times that she'd prefer to see people already in emergency shelters given the first chance at more permanent housing. Other critics charge that the program does not do enough to get at the root of the issue, be it drug or psychological problems. The city of New York, however, has been happy with the progress. Common Ground and eight partners have been contracted to provide housing for 1,000 of the city's most vulnerable homeless people.